Expository sermons are constructed from a thorough investigation of a text or texts of Scripture. To put it another way, expository sermons simply explain the Scriptures or a passage of Scripture verse by verse. Usually, expository sermons are the means by which preachers teach through a book of the Bible. Though expository sermons explain the Scriptures verse by verse; nevertheless, it is still important to have structure to your sermon. You may decide to preach through the book of Romans. The first part of Romans is about sin and salvation. When you read Romans 1:1-7, you will find the key to this passage is at the end of verse one. Paul's desire was to share Christ with great enthusiasm. You now have the main preaching point, Sharing Christ With Great Enthusiasm. 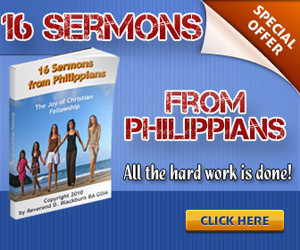 Paul's life tells you how you can share Christ with great enthusiasm. First, you need to have the right heart (1:1); second, you need to have the right goal (1:2-4), and third, you need to have the right challenge (1:5-7). 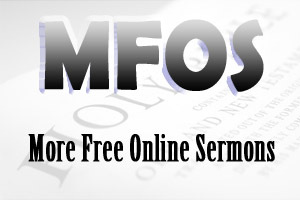 To view another example of an expository sermon outline, click on Expository Sermon Outlines. You can write expository sermons from a deductive paradigm or and inductive paradigm. A deductive expository sermon begins with the main preaching point followed by the sermon sub-points and incidental points. An inductive expository sermon begins with incidental sub-points building to the main preaching point. You may want to preach the story of Abraham and Isaac inductively. The main preaching point in this story is that God wants you to put Him first in all things (Genesis 22:1-19). What happens when your stability in life is shattered? Click on the links to check out the difference between An Inductive Sermon Outline and A Deductive Sermon Outline. In Christ Centered Preaching by Bryan Chapell, you will note Bryan's emphasis on expository preaching. Bryan Chapell states that other types of preaching that proclaim biblical truth are certainly valid and valuable, but for the novice preacher and for a regular congregation diet no teaching type is more important than expository preaching. QUOTE by Bryan Chapell: "Expository preaching attempts to present and apply the truths of a specific biblical passage ... [and] expository preaching endeavors to discover and convey the precise meaning of the Word of God" (Chapell 22-23). In How To Preach Without Notes by Charles W. Koller, you will see Koller discuss the importance of expositional preaching. Koller notes that expositional preaching can be delivered in three sermon types, expository, textual and topical. Koller notes that the expository sermon consist of exposition plus application and persuasion. QUOTE by Charles W. Koller: "An expository sermon derives its main points or the leading subhead under each main point from the particular paragraph or chapter or book of the Bible with which it deals (Koller 21). In How To Prepare Bible Messages by James Braga, you will find a brief definition of expository preaching. QUOTE by James Braga: "An expository sermon is one in which a more or less extended portion of Scripture is interpreted in relation to one theme or subject. The bulk of the material for the sermon is drawn directly from the passage and the sermon outline consists of a series of progressive ideas centered around the main idea" (Braga 53).